The iPhone 6s and iPhone 6s Plus will have reduced battery capacities compared to the current iPhones, according to reports. According to China's cnBeta, the iPhone 6s will feature a 1715 mAh battery and the 6s Plus a 2750 mAh battery - a decrease of 5.3 per cent and 5.5 per cent capacity respectively from the current models' 1810 mAh and 2910 mAh. Apple has made a point of how new operating system iOS 9 will be more energy efficient than iOS 8, including a new Low Power mode and new updates adding around an hour to battery life. British technology company Intelligent Energy recently claimed to have developed an iPhone that can go a week without recharging, running instead off a built-in hydrogen fuel cell. The company has made a working iPhone 6 prototype containing both a rechargeable battery and its own patented technology, which creates electricity by combining hydrogen and oxygen, producing only small amounts of water and heat as waste. The iPhone 6s and 6s Plus are likely to benefit from a new 12MP camera, capable of shooting 4K video, with the front camera capable of recording 1080p video at 60fps, 240fps in slow motion mode and flash support. The new phones are also expected to sport Force Touch technology, which detects how hard the user is pressing and allows different actions to be carried out accordingly. According to reports, the technology will allow menu "shortcuts" that enable users to find options on menus more quickly. One of the most prevalent rumours is that the new generation of iPhones will see the introduction of a new rose-gold model. Apple has sent out media invitations for a press event on Wednesday September 9, where chief executive Tim Cook is largely expected to introduce a revamped Apple TV box set alongside the new phones. The new box is expected to feature a touch-pad remote, extra inbuilt storage and Siri voice control for browsing and selecting programmes and films to watch, in light of a recent patent filing. The new box is expected to run a TV-optimised version of iOS 9 with a refreshed interface and, for the first time, may be opened up to the app community, with Apple expected to unveil a software development kit (SDK) that allows developers to build apps. At present, only a handful of third-party programs feature on the Apple TV and introducing an SDK and App Store would expand this significantly. It will also support Homekit, after Apple confirmed that Apple TV would act as a central hub for its connected home appliances, including ecobee thermostats, lighting kits and smart sensors. Apple users are under threat from an iPhone scam that sees them urged to call a number and pay up to £50 or $80 for a fix - or all their details will be stolen, it can be revealed. 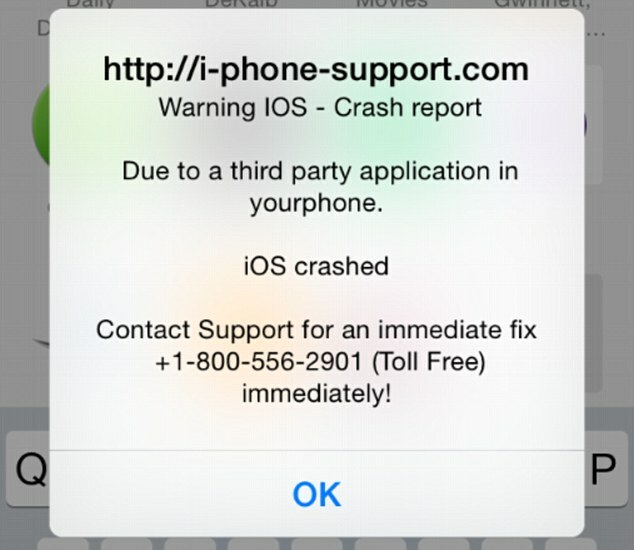 The issue - which appears to have been affecting users in the US for at least nine months but has since spread to Britain - sees a 'crash report' message pop up while users are on the Safari internet app. Users are then told to call one of a list of numbers - '1-800-480-4170' in the US or '0800 279 6211' or '0800 652 4895' in the UK - and someone will then ask for their credit card details to make a payment to solve the issue. The person answering the phone says a third party has been removing all their details from their handset - and this can only be stopped by paying up to £30 ($47) in Britain, or $80 (£51) in the US. However, all they would be doing it handing their credit card details to the conmen. Apple users have discussed the issue - which can apparently be averted by disabling pop-up adverts on a device - on an official support forum which has had more than 110,000 views. Other users say the issue is caused by adverts infected with malicious code, causing the warning to appear on otherwise safe and respectable websites. One user named Dizzer88 wrote on the forum last November: 'I too called the phone number to see what was going on. 'It went straight on hold when I called - didn't ring - and then when someone came on the line, it was a woman who I could barely hear due to the noise in the background. 'She stated that my iOS crashed and was no longer something on my iPhone 5S and that a third party was at that time taking all my info off my phone - nice 'scare tactic', eh?. 'She then said for $80 though she could reinstall iOS and just needed my credit card number -yeah, okay. 'So I said that was ridiculous as I had been using apps and my phone the whole time I was talking to her on speaker, and said I would call Apple Support directly. 'She told me they would say the same thing about having to pay to have iOS reinstalled on my phone. Gangs are harvesting expensive mobile phones from pubs and clubs in major European Cities every weekend — the majority of which are then sold abroad. Criminals are regularly traveling to locations to steal phones from unsuspecting revelers. Some groups are targeting clubs and pubs at weekends and public holidays to swoop on valuable smartphones such as Samsung and Apple. The gangs stay with friends or in budget accommodation in order to keep the costs down and ensure a profit — with some leaving the cities on the same evening having secured their bounty. The phone thieves typically work in twos and threes, targeting packed nightclubs. It is believed over two thirds of phone thefts occur during weekend nights in pubs and clubs. Those who are “harvesting” the phones then take them to another person who organises the re-sale of them. In many cases, the phones are sent abroad to prevent them being traced from the countries they are stolen from. And in other cases, the phones are stripped down and different pieces from different phones are swapped around, resulting in a totally different phone. Apple is planning to end the horror of leaving your phone at home, or in a bar. The firm is planning to issue an update to the Apple Watch allowing it to alert users if it spots the phone is not nearby. The first update for Apple's smart timepiece is also expecting to include a health feature alerting users of an irregular heartbeat. According to 9to5mac, the update will be announced at the firm's annual developer conference in San Francisco next month. 'The Watch will use its wireless signal to establish its location relative to the iPhone, and will optionally be able to notify a user if the iPhone is accidentally left behind,' it said. 'Apple wants to give [a user] a tap or a light notice if it thinks [he or she is] accidentally leaving [the] phone somewhere,' the site's source claims. 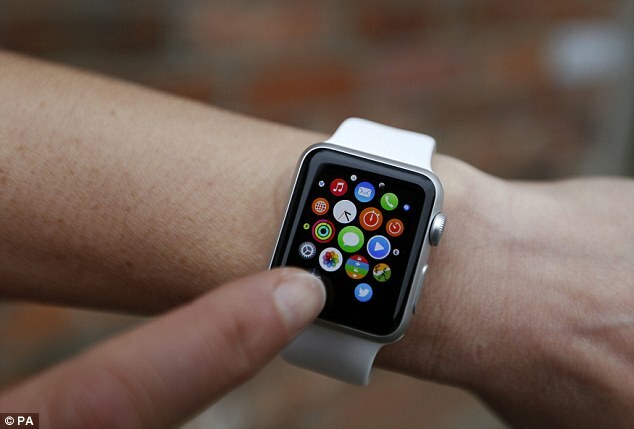 The update is also expected to address recent security concerns over the watch. A video has revealed how the Watch can be reset and paired with another phone within minutes - and without ever having to enter a passcode. And because the Watch doesn't have its own GPS chip, once it's lost or stolen it can't be tracked. At the same conference Apple is also set to reveal its plans for television. Instead of a traditional remote with buttons, it is expected to use a touchpad to allow users to easily navigate around, choosing from apps, live TV and on demand services. The report claims the touch pad can be used for scrolling around and there will also be two physical buttons, the person said. An Apple spokesman, declined to comment on the product. It is also believed to be working on a 25 channel live streaming TV service, which could be revealed at the same time. · Register your mobile phone with your service provider. · Take careful note of your unique 15 digit mobile phone International Mobile Equipment Identity (IMEI) number. By pressing *#06# on your phone keypad the IMEI will appear on the screen. · Enable the PIN Security feature and keep your phone locked at all times. · When out and about, keep your mobile phone out of public view, be streetwise and always be aware of your surroundings. · Never leave your mobile phone behind in an unattended vehicle. · If your mobile phone is lost or stolen, contact your mobile phone service provider immediately to suspend your service and prevent unauthorised calls being made and billed to you. · Your provider will block your SIM card and IMEI number to prevent your phone from being used on the mobile network. · Report the loss or theft to the Police, providing identification numbers for your SIM card and IMEI number. This information may assist in the recovery of your mobile phone. Tablet device owners should take great care of their property. It only takes a moment of distraction for a thief to take your Tablet device. Along with cash, laptops and tablets are the most common items taken in burglaries. The cost of replacing the data contained on the device can sometimes cost more than replacing the hardware itself.